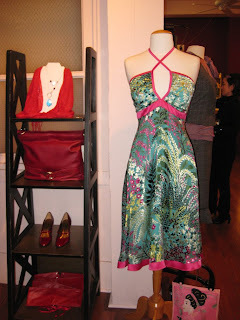 Love and loveliness reigned supreme at the Blushing Boutique Valentine's Day shopping party I attended last night. I met one of Blushing's designers, Kathi Moore, at a networking event in January and had been meaning to drop by the boutique ever since but never got around to it. When Kathi sent out the Facebook invite and mentioned frocks, fondue, and wine--well, it was a very difficult invitation to resist. After all, along with Ric Yuenn and Narcissist Clothing Co., Blushing is one of the best places in Vancouver to find a beautiful, locally designed and made girly girl dress for a special occasion. The store is stocked full of sweet dresses and great separates, mostly by local designers. Blushing also carries a carefully edited selection of shoes and denim, and trust me when I say that it's all very ladylike denim--dark washes and flattering fits, no rips or tears or false distressing to be seen. 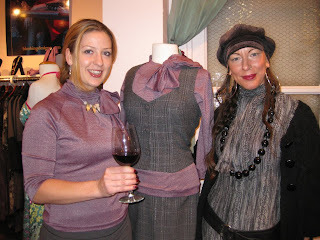 Designers Malene Grotrian and Kathi Moore pose by Malene's tie-neck blouse (note that she's also wearing it!). One of Malene's signature pieces is the bustier. She lines hers with metal boning so that the bustier is comfortable and moves with the body but still retains its slimming silhouette for years to come. Malene explained that cheaper bustiers use plastic boning to cut costs, but the plastic doesn't last long because it heats up when worn close to the body, and as the body moves and bends and sits and stands, the plastic warps with age and the bustier loses its shape. 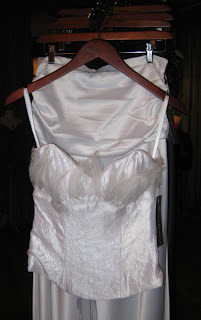 I got to try on one of Malene's bustiers later that night, an electric blue satin number. It was the first time I'd ever tried wearing one and it was amazing. I may have to save up for one. Part of Blushing's spring/summer 2009 collection. I love the floral print and hot pink accents on the silk halter dress! 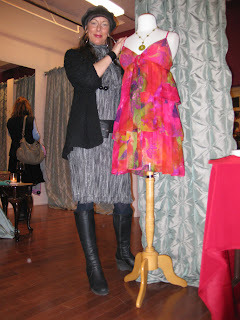 Kathi stands next to another dress in Blushing's spring/summer 2009 collection. "This one is sure to be a hot seller this season," she says. The lovely lady in the fuchsia dress and leopard print coat and accessories is Jacqueline Ryan, a longtime Blushing client and one of the most genuine and warm fashionistas I've ever met. We closed the place down chatting up a storm. Jacqueline will be modelling some of Malene's clothes in an upcoming show. I can't wait for that event! As you can tell from this photo, I wore the Tar-jay jacket again. I got a giddy little thrill at the disbelieving looks on people's faces when I told them where it was really from. you look gorgeous! I love that you wore that jacket :-) Thanks for the Bustier tips--I had no idea! Both you and the shoppe look incredible! I want that bustier! That halter dress is glorious. Glorious, I say! I sure like the spring/summer hot seller by kathi! gorgeous - i'm going to have to go check that out! i love that white bustier. i wouldn't have anywhere to wear it to, persay, but i'd still love to own it! That tie-neck blouse is so cute! P.S. Happy Valentine's Day, L! Love that jacket. Looks like a fun little store. Love the post! Gorgeous clothing. That sounds like such a fun evening and you look so stylish! Great photos! Hehe I love that cheetah print coat that girl is wearing. Wow what a great event to attend! 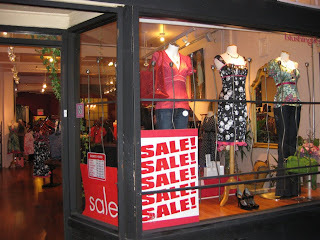 =) That shop looks so wonderful -- all the items look so soft, comfortable, feminine and dressy! Just the sort of outfits I wouldn't mind wearing day after day... You looked great in that white coat!